Dror Burstein contemplates works of art from various cultures— Europe, the Far East, Israel, ancient Mesopotamia—that portray animals which are caged, suffering or dead at the hands of humans. In clear but delicate language that appeals to the eye and the heart, Burstein writes about the still-life paintings, sculptures and photographs in which the treatment of animals is an outrage. The images depict animals that have been dismembered at the butcher’s or in abattoirs; hunted birds; fish laid out at a London market; chained apes in Antwerp’s port; a lion hunt by an ancient Assyrian monarch; various biblical scenes, such as the Binding of Isaac with the ram caught in the thicket, and more. Among them, Burstein also seeks out images that protest the way in which animals are used by humans, whether they be artists, cooks or diners. They show a different relationship between man and beast: one that is harmonious and not violent. 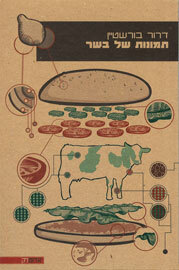 Meat and Art makes incisive statements about human responsibility, solidarity, the meaning of death, suffering and art. It offers cultural, artistic and literary enrichment to the vegetarian and vegan conversation underway in the world, as well as an activist look at the fine arts that will intrigue anyone interested in art and art criticism. There are also animal poems written by various poets. Dror Burstein’s gripping book offers us moments of poetic reflection … Burstein looks at sculptures and images of animals from a variety of cultures. One of the achievements of his book seems to be the elegant movement from the edges of the West to the ends of the East … On this refined journey from the Occident to the Orient, Burstein spreads out before us an expansive interpretative horizon. A book that is heartening, and gratifying to encounter … Evokes respect … This is a book that satisfies, reminding us that writing about art can be profound. Even very young people will be able to enjoy it. The author’s main task, at which he succeeds immensely, is to elucidate the artist’s activity. The pictures are heart-rending … Burstein refrains from pontificating or speechifying with excessive pathos … A sad experience, painful, and mainly enlightening. On the surface, this is a very analytical book, positing its agenda in a clear and open fashion, and there is no fiction here, no manipulation, but there are brief moments at which the speaker, by means of only one sentence, short, in a minor key, but so very strong, outlines the proportions and almost makes one shudder with the Zen precision in which it is written … This is a book about feelings, but actually feelings are only the result; if you succumb to it and read it the way it should be read, then in the end you also feel what you should feel … Meat and Art offers a kind of unique subversion in its very tempo, its very observation, its very being. In effect it produces an alternative soft, silent analytical kind of discourse. Burstein writes contemporary Hebrew philosophy about animals, and it is more innovative and sophisticated than much else happening in the field. For Burstein, art is a sharp tool of social criticism, but it is also capable of expressing the proper life. One of the great pleasures of reading this book is that Burstein manages to weave together the distortion and its repair. Burstein succeeds in achieving something rare: In his interpretation of the paintings, he manages to cut us off for a moment from what we knew about the art, and to show us classical works in which the animal does not serve as an instrument for fathoming human nature, but rather the other way round. He relates to the animal not as an object, but as a subject. An engrossing and original look by an intriguing writer at man’s attitude to beasts in art … Everyone to whom art and morality, both together or each one separately, are of interest will find much to occupy himself in this remarkable book. As is his wont, Dror Burstein touches upon deep and broad issues in a clear and thought provoking fashion … The complex of interesting ideas and insights that Burstein raises enables a different outlook, and arouses thoughts about suffering, death, life and art.